Fahir Atakoglu is an international award winning composer and pianist well known in the fields of large symphonic works and film music. For his work in film composition, Fahir won first prize for Documentary Music Composition at the Milano Film Festival, and won "The Best Song Award" from The Mega Channel in Greece. 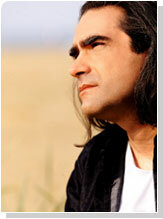 Also an accomplished solo artist, Fahir has released 14 albums since his solo debut in 1994. His 15th album "Istanbul in Blue" went up to 1 in World Music Albums Charts and up to 38 in top 200 Jazz Albums Charts. Ahmet Ertegun, of Atlantic Records, referred to Fahir Atakoğlu as "... one of the outstanding pianists and composers in Europe today ... at the cutting edge of the world music."